In an industry dedicated to the storage and treatment of potable water, condensation exposure is unavoidable as vapor from saturated air condenses onto the colder surfaces of tanks, pipes and other metal components. Even when coated or wrapped with insulation materials, such as fiberglass or mineral wool, these surfaces cannot escape the deteriorating effects of condensation exposure. Insulated surfaces are vulnerable to moisture infiltration at temperature ranges above freezing and below 300 degrees F that can cause corrosion under insulation (CUI), which is a destructive and costly problem in water storage and treatment facilities. Too often, the problem goes undetected until surfaces are corroded beyond repair. 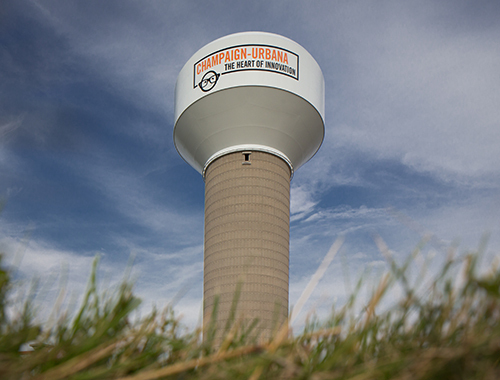 From single pedestal water tanks to water treatment plant pipe galleries, control of substrate temperature and condensation is being provided by a spray-applied, thermal insulating coating developed by Tnemec. Series 971 Aerolon Acrylic combines high-performance coatings technology with aerogel particles that impart exceptional insulative properties to help control condensation. The high-build, single-component coating is lightweight and easy to apply in tight or confined locations. Aerolon helps to control condensation when applied to the underside of the tank belly that rests inside the cylindrical shaft support structure. During the summer, when temperatures are elevated, condensation can cause mold and mildew growth, accelerated corrosion and moisture damage to electrical systems and property stored inside the pedestal’s base cone. Otten has specified the use of Aerolon on several water tanks in Illinois to control condensation formation underneath the tank. It is also being applied on the access tube, which extends through the middle of the tank, and on inlet/outlet piping in combination with traditional insulation systems. Typically, inlet/outlet pipes are wrapped with a fiberglass or mineral wool insulation to prevent them from freezing in the winter. During summer months, warmer air condenses onto the colder pipe surface and is absorbed by the insulation closest to the pipe. As the insulation fibers become wet, they compress onto one another causing a loss in efficiency. Aerolon bonds to the substrate surfaces forming a durable moisture barrier that resists the infiltration of moisture, while achieving thermal conductivity on par with most traditional insulation materials. As part of a complete recoating project, specifications require the belly of the tank to be prepared in accordance with SSPC-SP6/NACE No. 3 Commercial Blast Cleaning and given a primer coat of either a zinc-rich urethane or water-based epoxy coating. Aerolon is spray-applied as an intermediate coat at 50 mils dry film thickness (DFT). A topcoat of epoxy or acrylic polymer is applied over the Aerolon-coated surface. A thick-film mortar spray pump, such as the WIWA Series 410.09 with 200 feet of hose, allows the pump and carriage to remain on the ground while applicators work from above. With the pumping assembly on the ground, one person can mix the coating and fill the hopper while another applies the material, making the application easier and more efficient. Aerolon can also be applied on pedestal water tanks as an overcoat to an existing coating system that has been power tool cleaned or in combination with an epoxy tie coat. 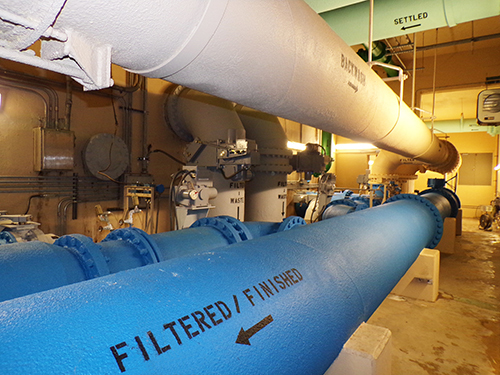 Water treatment plants are also using Aerolon in pipe galleries to control moisture buildup caused by elevated temperature and humidity conditions during summer months, according to Andy Hoffman, Director – Insulation and Specialty Products for Tnemec. Hoffman cited the Russellville City Corporation Water Treatment Plant in Arkansas where moisture buildup was causing premature corrosion in a filter pipe gallery. Aerolon insulative coating system was specified by Garver, a multi-disciplined engineering, planning and environmental services company based in North Little Rock, Arkansas. Garver chose the coating system over installing dehumidification equipment, which would have necessitated the addition of electrical systems and controls. “The coating system ceased corrosion on the pipes, provided the required thermal protection and pipe color needed to identify the pipes,” the Garver website verified. “The solution was effective, required minimal maintenance and no additional costs or training." The Russellville City Corporation project earned an Engineering Excellence Award from the American Council of Engineering Companies of Arkansas in the special projects category.